What do you think this freaky looking skull belongs to? As usual, suggestions and any questions below in the comments section – I will try to provide useful responses. I can say with some confidence that it is a tetrapod! Also I believe it is a mammal. Is it a juvenile? And is it missing any teeth? I think it’s an adult, because the teeth look well developed. Looks like it might of lost a canine but it’s not clear. A sooty mangabey looked promising but the eyes on this aren’t don’t look forward facing enough. You are absolutely spot-on about it being a tetrapod and a mammal. It has its full set of teeth and it is actually a juvenile (good question!). Also, great observation about the mandible – but it’s not a pig or tapir. It’s not a primate either. You’re warming my brain up this morning with this one Paolo. Checked through marsupials (face not long enough), and rodents. The structure of the jaw suggests that the incisors are not particualr incisive, so rather than a chisel like action, they almost look part of the gripping/crushing process of retrieving whatever vegetation it eats. Thrown off by the very rounded braincase and large infraorbital foramen. Is it the skull of a juvenile? 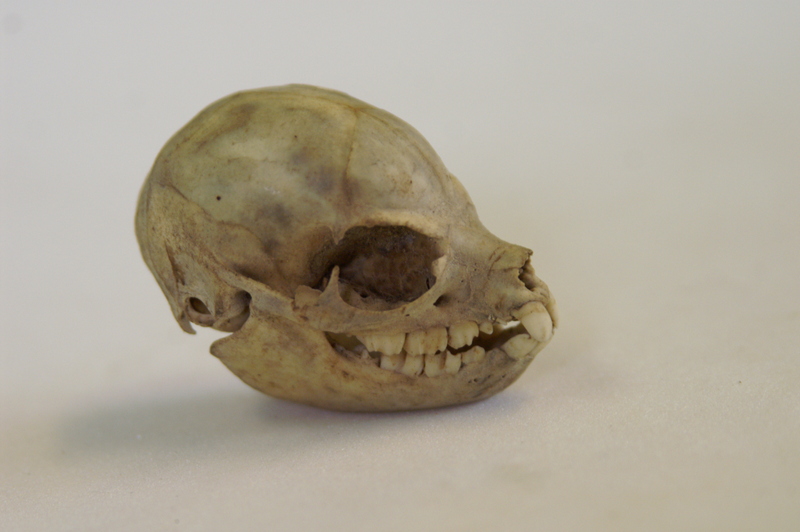 It is the skull of a juvenile – I’m amazed that I’ve managed to stump even you (so far). I agree with Jim, the rounded brain case and the other thing are really confusing me! I was looking at kinkajous which looked promising but not quite right. Using newfound knowledge(possibly ineptly), is it a member of the Euarchontoglires? Kinkajous are very funky and sufficiently odd, but this is not one of them. It is also not a member of the Euarchontoglires. Doing well at narrowing it down though! The adult form of this animal could have a rather longer snout, and perhaps a less rounded brain case. Having said that, I shall now proceed with the “brute force and ignorance” approach! Is it a placental mammal? The adult form does have a slightly longer snout and a much less rounded brain case. It is a placental mammal (brute force maybe, but certainly not ignorant!). If yes, then I think its a juvenile hyrax. It is in the Afrotheria and you are absolutely right in what you think it is – congratulations! I get the impression that an expert would have considered the teeth in a more systematic manner. As for my brute force route, I was a bit worried that the scientific classification scheme was not quite as absolute as I first thought. That’s the joy of biological classification – it changes fairly regularly as phylogenies are updated by new analyses. The mammals were overhauled about 10 years ago and are still settling out somewhat. The teeth are a good identification cue, but to be fair the photo I provided didn’t really provide sufficently detailed images of the teeth for them to be hugely useful. Muchos kudos for the successful id.! So, specifically, is it Procavia capensis (Juvenile)? Kudos for venturing into that Anthrenus trap on level 6 – it’s a lovely little museum, just a shame it’s not properly maintained. As it so happens, I am uncertain as to the species – that was something I was hoping to find out in time for the answer to be posted on Monday (at the moment it is only identified to family level on the label). It’s a little tricky without the right comparative material, particularly since it’s a juvenile and they are quite distinct from the adult morphology.